Bus from Kuala Lumpur to Kemaman is one of the most effective form of transportation to travel between the two cities. This bus service is important for resident of Kemaman who is working or studying in Kuala Lumpur. They usually travel back and forth from their hometown on weekends or during holiday. Kesatuan Express, Transnasional and Utama Express are few bus operators who provide bus from Kuala Lumpur to Kemaman. Transnasional is the dominant player among the other bus operators by having up to 8 daily departures. Their combined trips have total up to 17 daily departures from Kuala Lumpur to Kemaman. There are several choice of departure times from Kuala Lumpur to Kemaman. The first bus leaves TBS bus terminal at 8:29am and runs at regular intervals of around 30 minutes to 1 hour until the last bus departs at 11:00pm TBS. The journey duration from Kuala Lumpur to Kemaman takes about 4.5 hours depending on the road traffic condition. The duration could take much longer time especially during festive season with heavy traffic jam at Karak Highway. At least one stopover will be given during the journey. Passengers can go for washroom or buy some snacks during stopover. The bus fare from Kuala Lumpur to Kemaman is charged reasonably at RM 29.90. The pick-up location is at the largest transportation hub in Kuala Lumpur, Terminal Bersepadu Selatan (TBS). Passengers can take public bus, KTM train, monorail or taxi to Terminal Bersepadu Selatan. The drop off location is at Kemaman Bus Terminal. 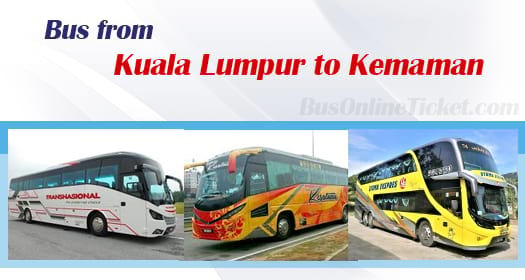 Book your bus from Kuala Lumpur to Kemaman at BusOnlineTicket.com to avoid any hassle from travelling all the way to the bus terminal just to buy a ticket. BusOnlineTicket.com provide many payment methods such as internet banking, Paypal, credit card, Alipay and etc. Instant confirmation email will be sent to your email address upon payment is successfully made.